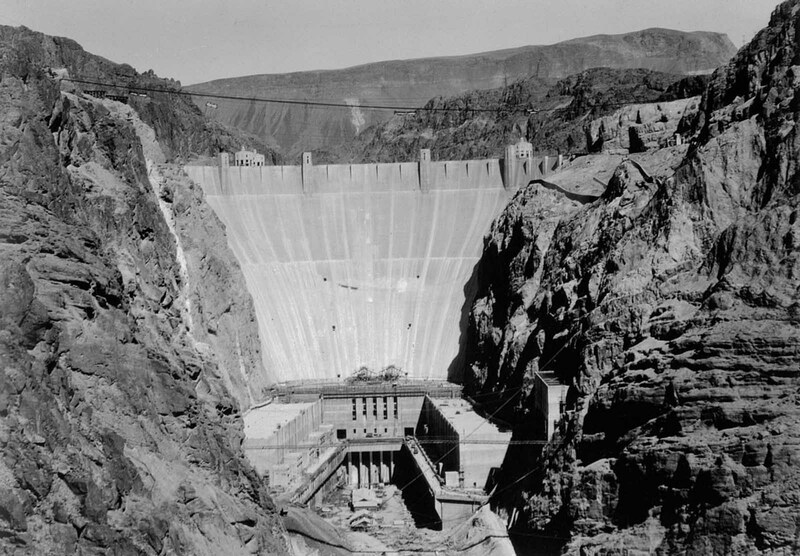 Hoover Dam was constructed between 1931 and 1936 during the Great Depression and was dedicated on September 30, 1935, by President Franklin D. Roosevelt. Herbert Hoover, the 31st president of the United States and a committed conservationist, played a crucial role in making Davis’ vision a reality. 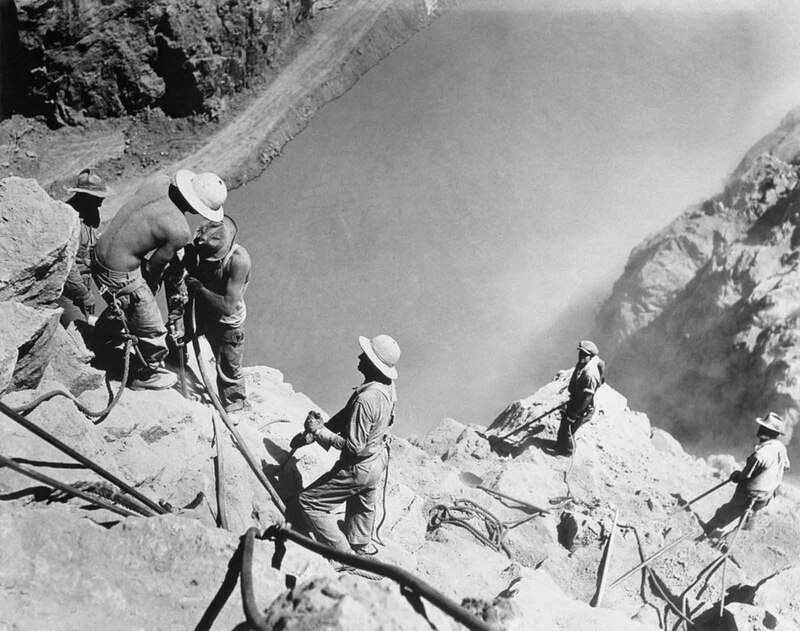 As secretary of commerce in 1921, Hoover devoted himself to the erection of a high dam in Boulder Canyon, Colorado. 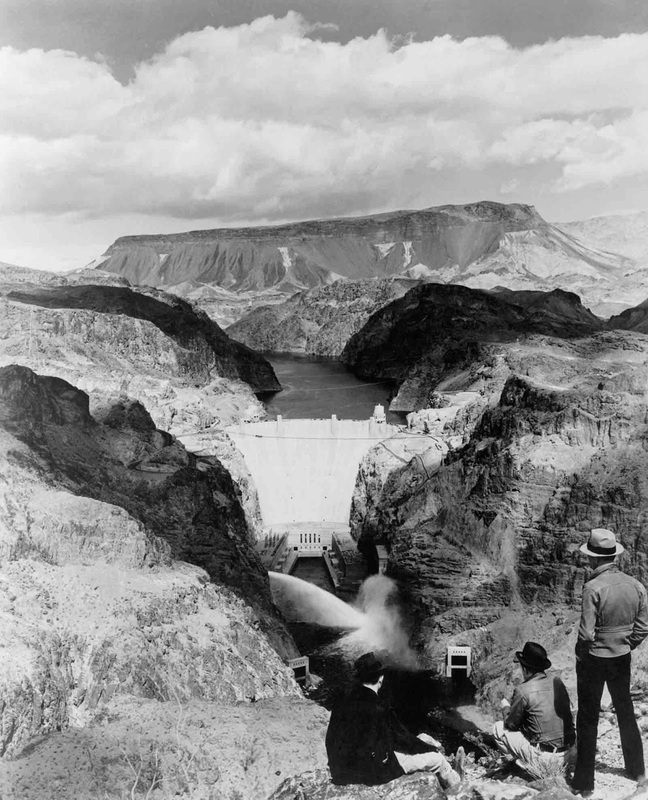 The dam would provide essential flood control, which would prevent damage to downstream farming communities that suffered each year when snow from the Rocky Mountains melted and joined the Colorado River. Further, the dam would allow the expansion of irrigated farming in the desert, and would provide a dependable supply of water for Los Angeles and other southern California communities. In 1929, Hoover, now president, signed the Colorado River Compact into law, claiming it was “the most extensive action ever taken by a group of states under the provisions of the Constitution permitting compacts between states”. 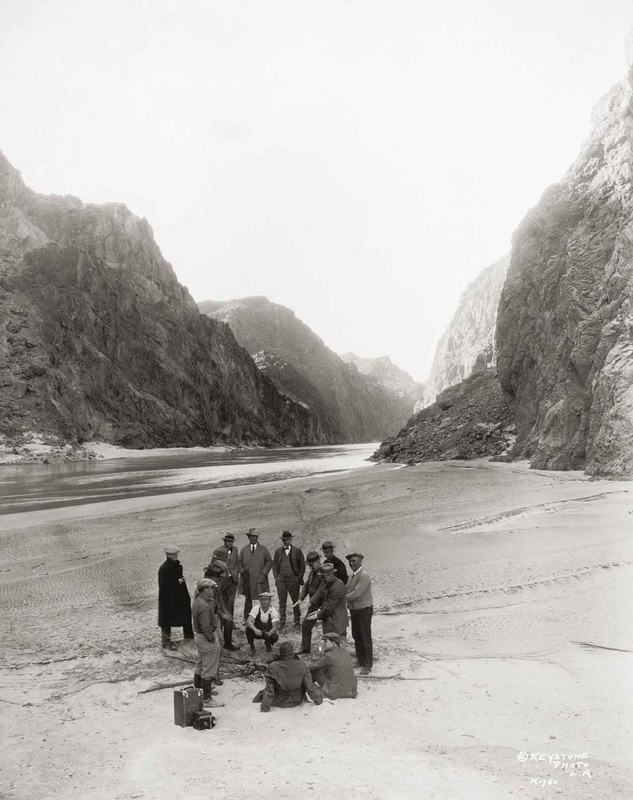 An inspection party near the proposed site of the dam in the Black Canyon on the Colorado River. 1928. 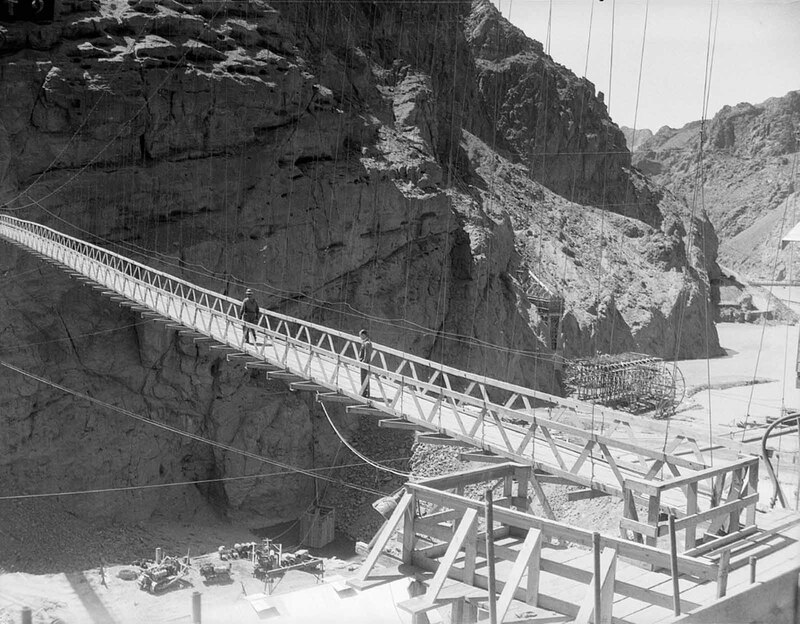 The Colorado River had to be diverted before construction could begin. The riverbed had to be dredged clear of deep silt and sediment to expose a bedrock foundation for the building of Hoover Dam. 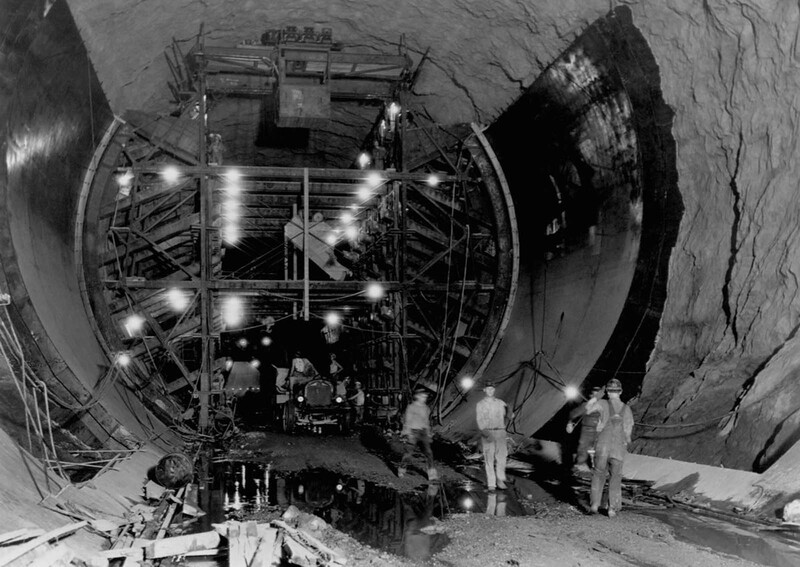 It was a tedious process of digging four diversion tunnels through canyon walls that would divert river flow around the dam site to join the Colorado River farther downstream. A total of 3,250,000 cubic yards (2,480,000 m3) of concrete was used in the dam before concrete pouring ceased on May 29, 1935. In addition, 1,110,000 cu yd (850,000 m3) were used in the power plant and other works. More than 582 miles (937 km) of cooling pipes were placed within the concrete. 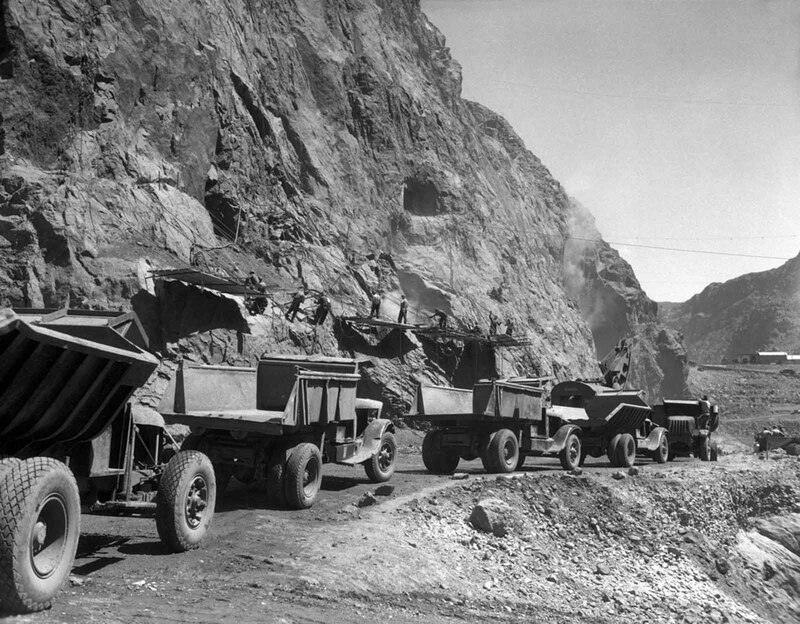 Overall, there is enough concrete in the dam to pave a two-lane highway from San Francisco to New York. 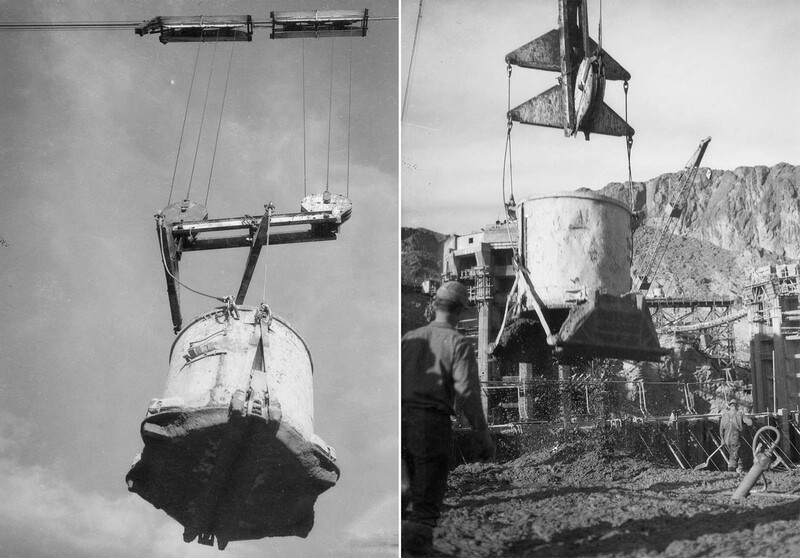 An overhead cableway system lifted the buckets and lowered them to the forms. At peak production, one bucket was delivered about every 78 seconds. 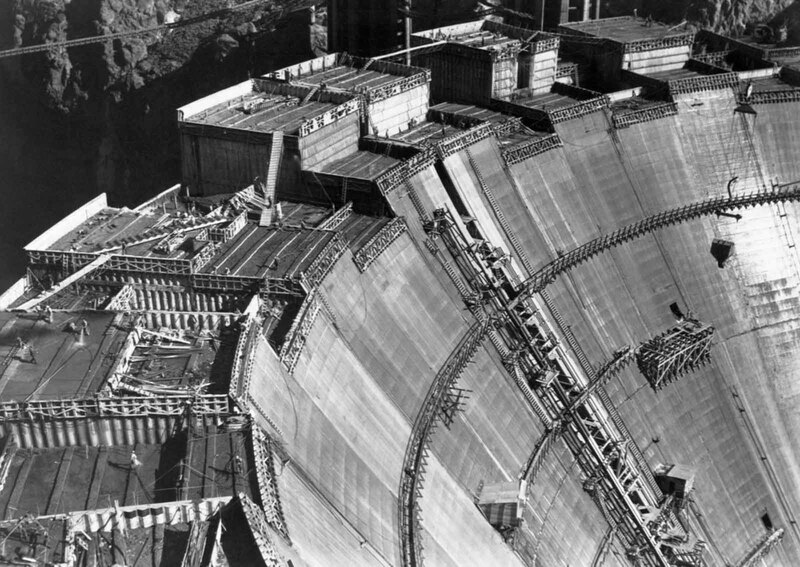 Concrete cores were removed from the dam for testing in 1995; they showed that “Hoover Dam’s concrete has continued to slowly gain strength” and the dam is composed of a “durable concrete having a compressive strength exceeding the range typically found in normal mass concrete”. 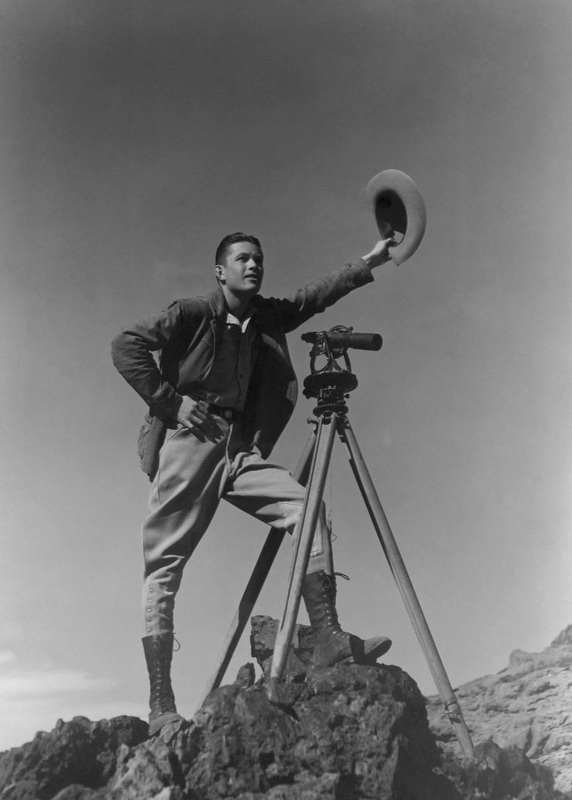 A surveyor signals to colleagues during the construction of the dam. 1932. 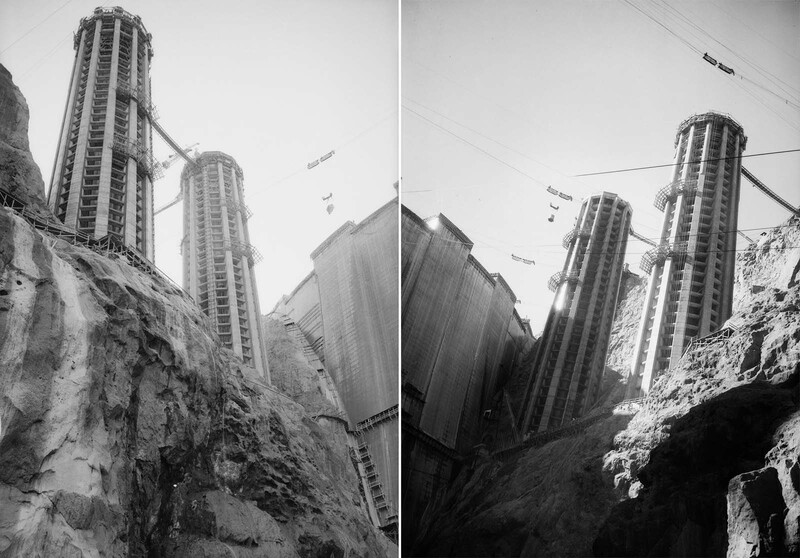 The base of Hoover Dam alone required 230 individual gigantic blocks of concrete. Five-foot tall blocks of varying width, ranging from 25 square feet on the downstream face to 60 square feet on the upstream face. Columns were linked together like a giant Lego set with a system of alternating vertical and horizontal schemes. It is interesting to note that it would have taken about 100 years for the concrete to cool and properly cure without engineering intervention. The chemical heat generated by concrete setting was dissipated by imbedding over 582 miles of one-inch steel pipe through the interconnecting concrete blocks that circulated ice water. Its own ammonia refrigeration plant that cooled the water was capable of creating a gigantic 1000 pound ice block every day. 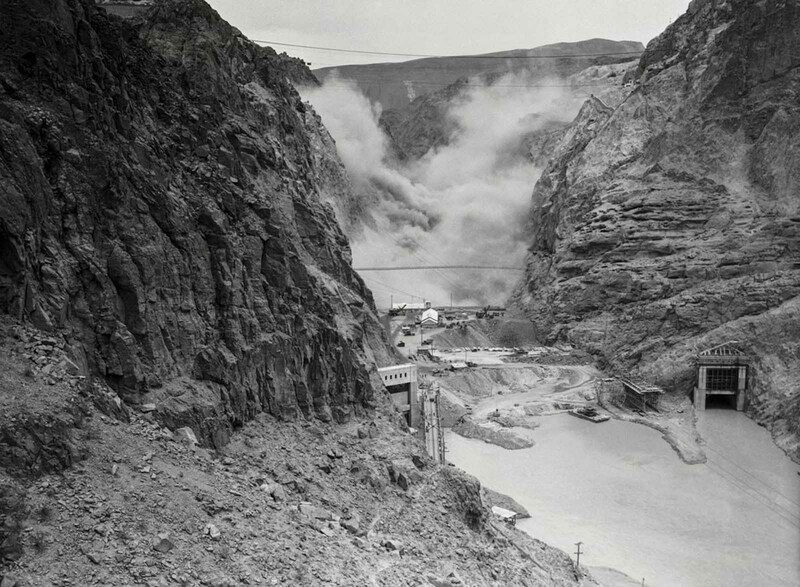 Four tons of dynamite are detonated in the canyon in the early stages of construction. May 12, 1933. The cooling pipes were subsequently back-filled with concrete to create added strength. As an arch-gravity dam, the massive water pressure of up to 45,000 pounds per square foot at the base of Hoover Dam, is held back by gravity. The arch-curved structure against the lake reservoir dissipates that pressure into the canyon walls equally on the Arizona and Nevada side. 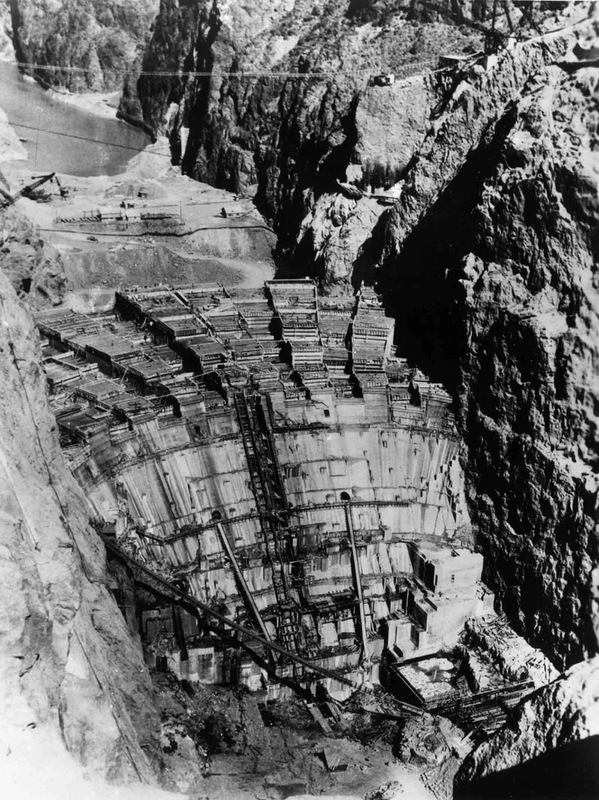 There were 112 deaths associated with the construction of the dam. The first was J. G. Tierney, a surveyor who drowned on December 20, 1922, while looking for an ideal spot for the dam. The last death on the project’s official fatality list occurred on December 20, 1935, when an “electrician’s helper”, Patrick Tierney, the son of J. G. Tierney, fell from an intake tower. Included in the fatality list are three workers, one in 1932 and two in 1933, who committed suicide onsite. Ninety-six of the deaths occurred during construction at the site. Of the 112 fatalities, 91 were Six Companies employees, three were BOR employees, and one was a visitor to the site, with the remainder employees of various contractors not part of Six Companies. Soon after the dam was authorized, increasing numbers of unemployed people converged on southern Nevada. Las Vegas, then a small city of some 5,000, saw between 10,000 and 20,000 unemployed descend on it. 1933. 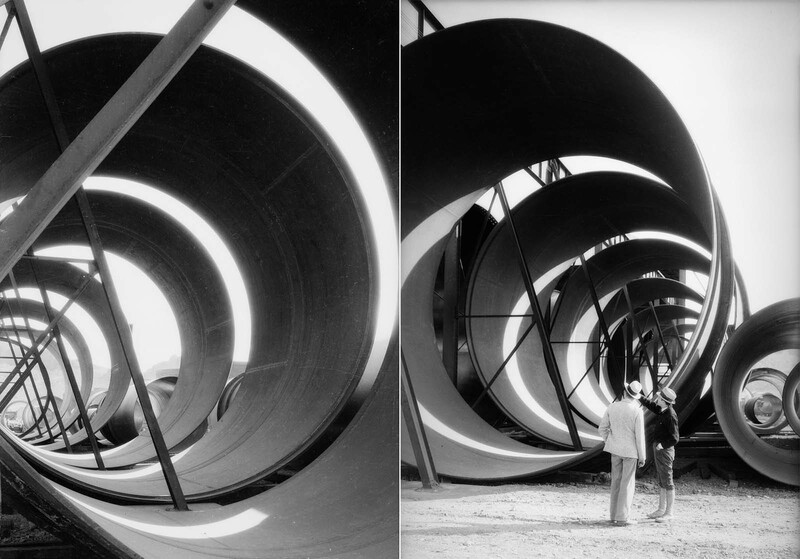 To protect the construction site from the Colorado River and to facilitate the river’s diversion, two cofferdams were constructed. Work on the upper cofferdam began in September 1932, even though the river had not yet been diverted. 1933. 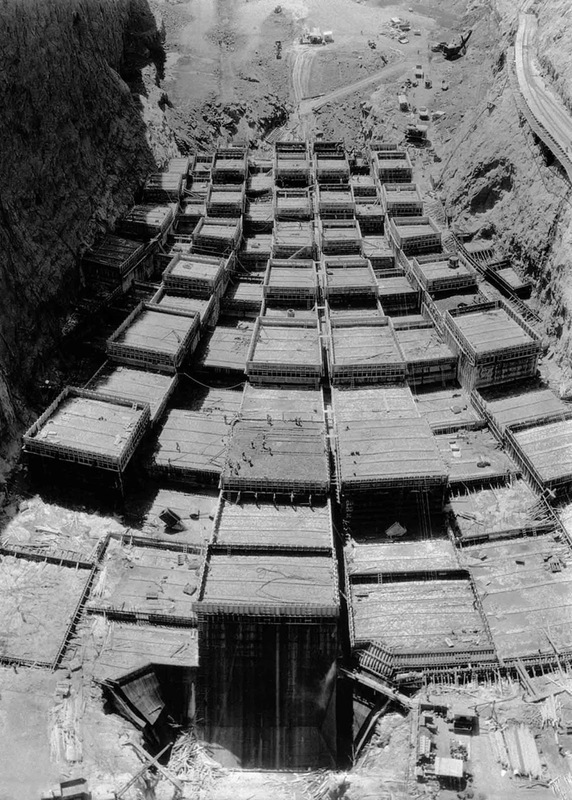 The cleared, underlying rock foundation of the dam site was reinforced with grout, called a grout curtain. 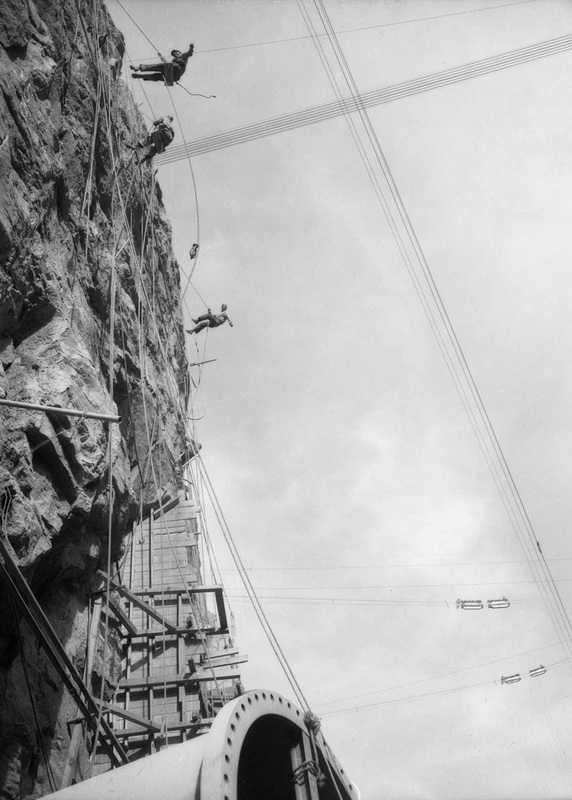 Holes were driven into the walls and base of the canyon, as deep as 150 feet (46 m) into the rock, and any cavities encountered were to be filled with grout. This was done to stabilize the rock. 1933. “High scalers” use jackhammers to shave loose rock off the walls of Black Canyon. 1935. “High scalers” rappel down the canyon wall. 1934. 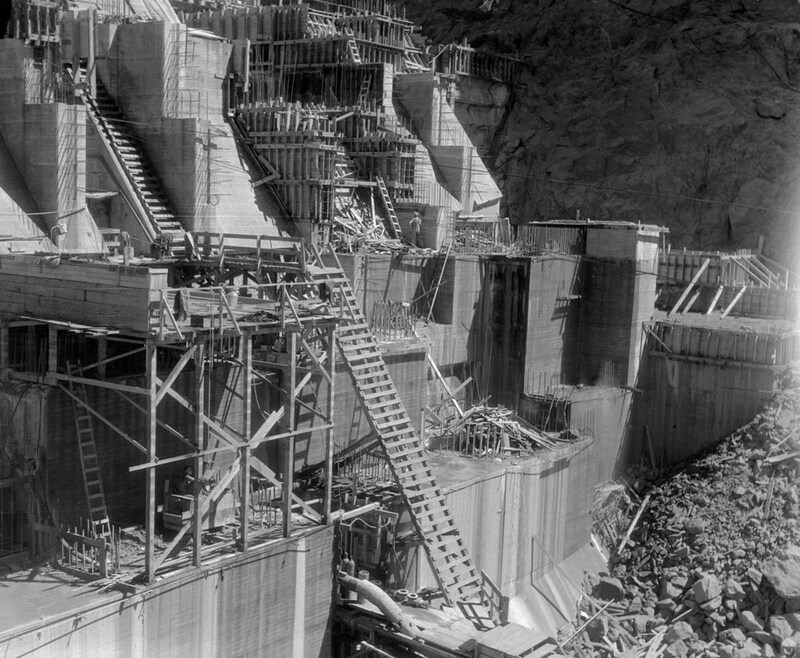 The concrete foundation of the dam is poured into separate blocks called “lifts”. September 11, 1933. Since concrete heats and contracts as it cures, the potential for uneven cooling and contraction of the concrete posed a serious problem. 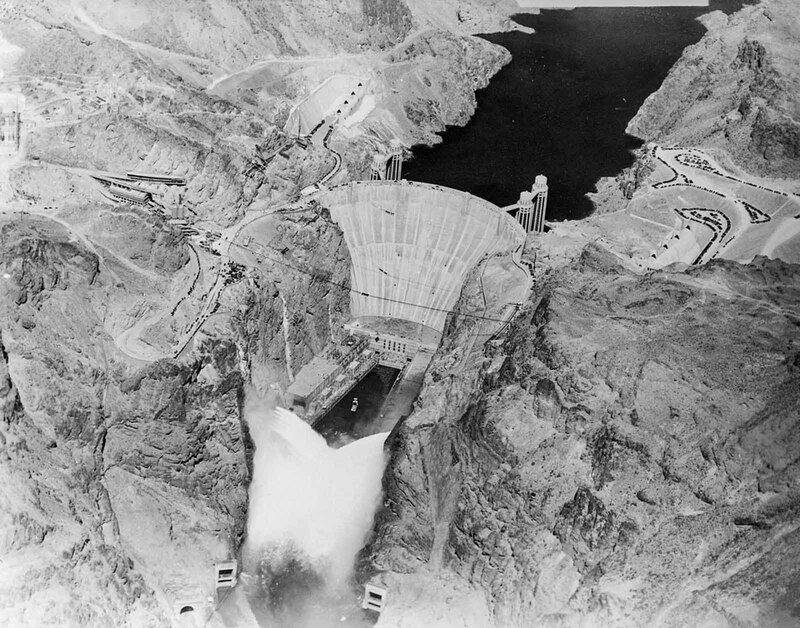 Bureau of Reclamation engineers calculated that if the dam was built in a single continuous pour, the concrete would take 125 years to cool, and the resulting stresses would cause the dam to crack and crumble. Instead, the ground where the dam would rise was marked with rectangles, and concrete blocks in columns were poured, some as large as 50 ft square (15 m) and 5 feet (1.5 m) high. The concrete was delivered in huge steel buckets 7 feet high (2.1 m) and almost 7 feet in diameter. 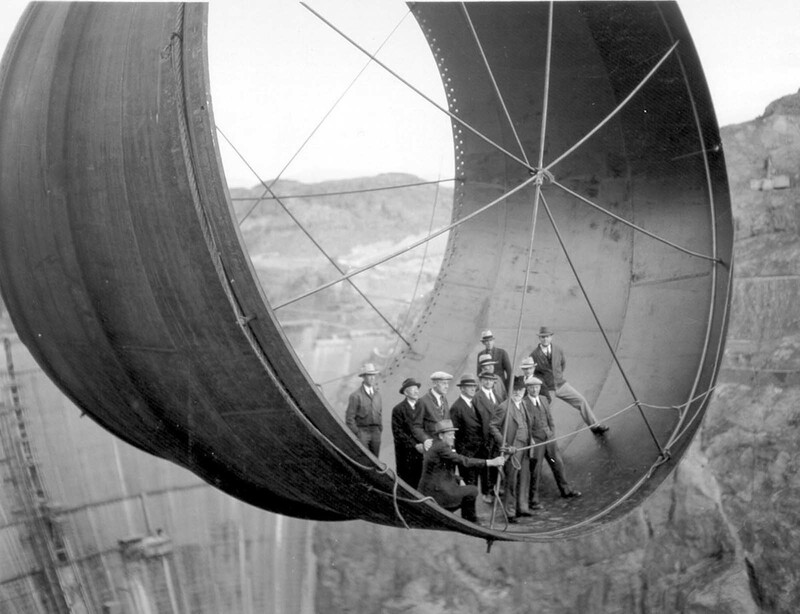 Officials ride in one of the penstock pipes of the soon-to-be-completed Hoover Dam. 1935. 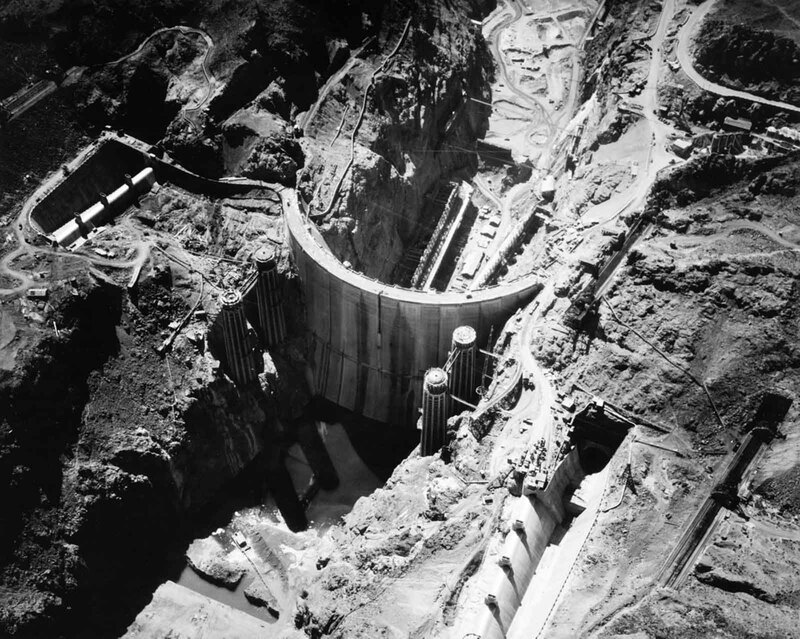 A total of 3,250,000 cubic yards (2,480,000 m3) of concrete was used in the dam before concrete pouring ceased on May 29, 1935. 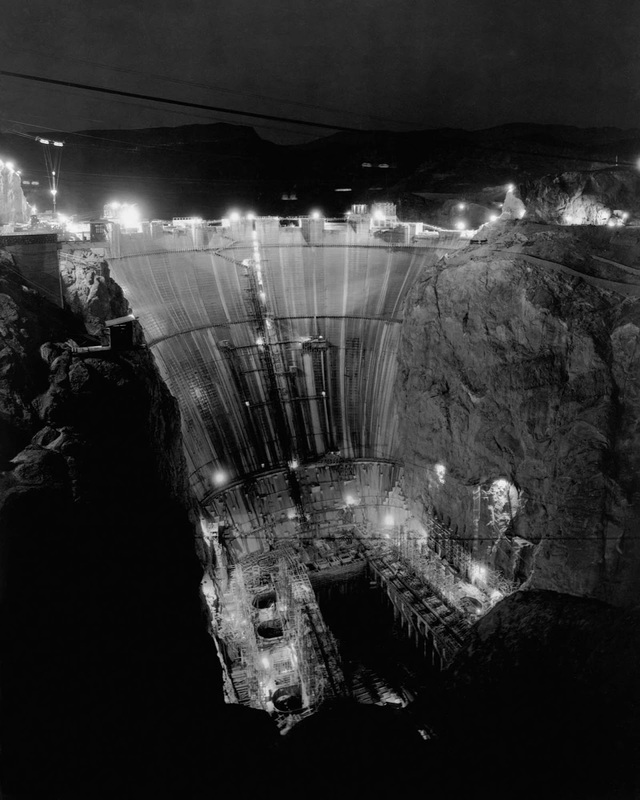 Concrete cores were removed from the dam for testing in 1995; they showed that “Hoover Dam’s concrete has continued to slowly gain strength” and the dam is composed of a “durable concrete having a compressive strength exceeding the range typically found in normal mass concrete”. 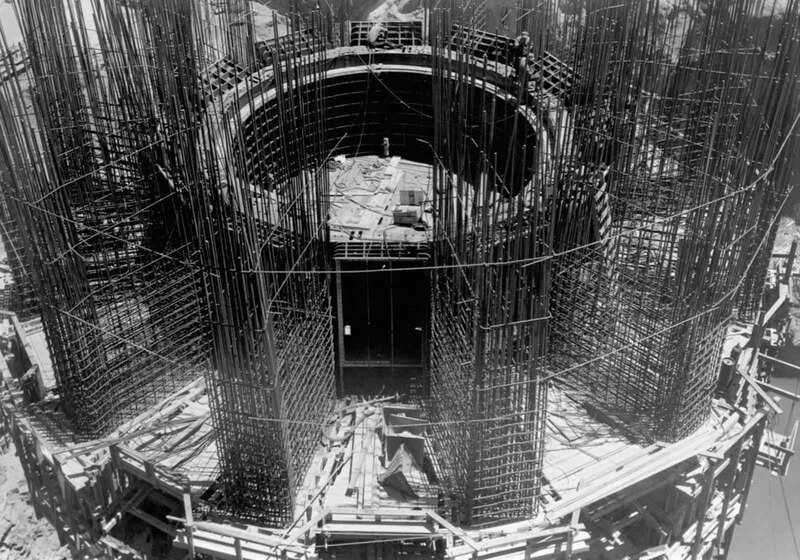 The base of one of the intake towers under construction. 1934. More than 582 miles (937 km) of cooling pipes were placed within the concrete. 1934. Water flowing over the spillways falls dramatically into 600-foot-long (180 m), 50-foot-wide (15 m) spillway tunnels before connecting to the outer diversion tunnels, and reentering the main river channel below the dam. 1934. 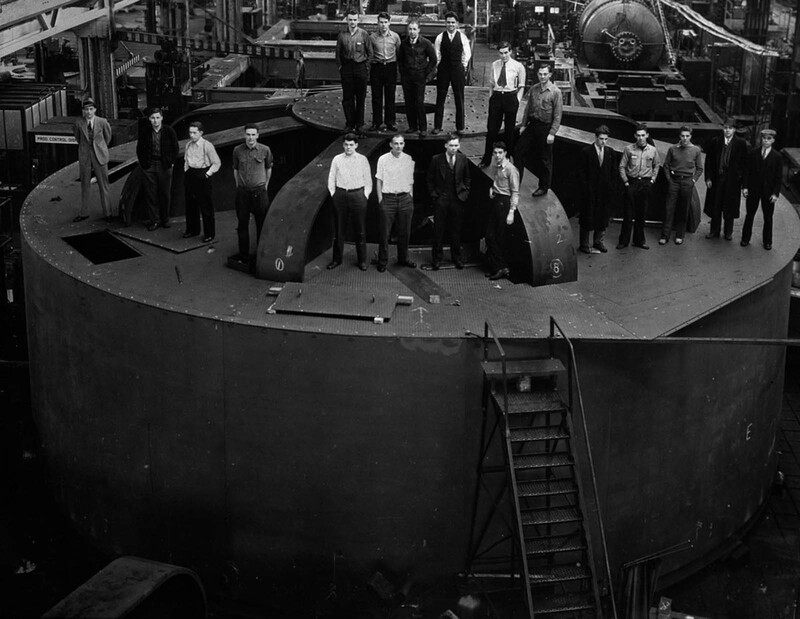 Student engineers stand atop one of the 2 million-pound hydroelectric generators for the dam at the General Electric factory in Schenectady, New York. 1935. 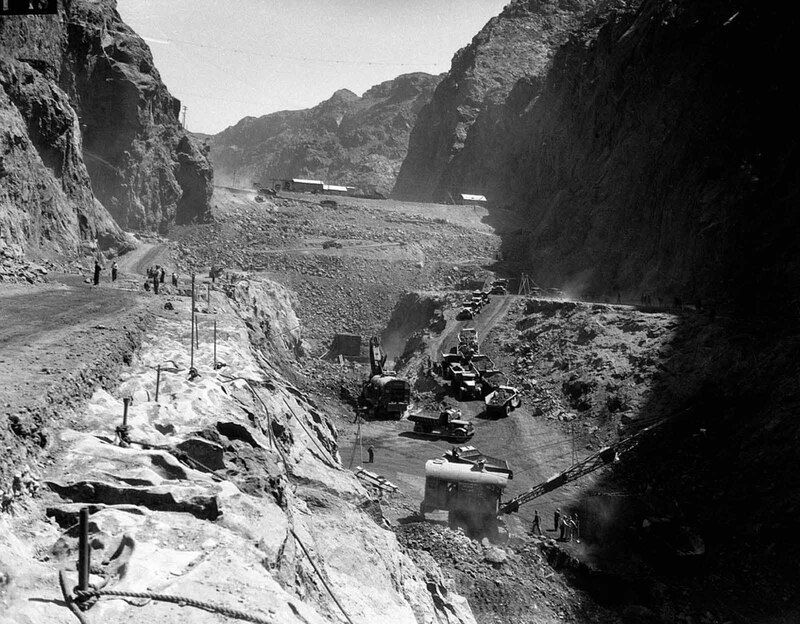 Construction on the dam proceeded day and night. February 25, 1934. 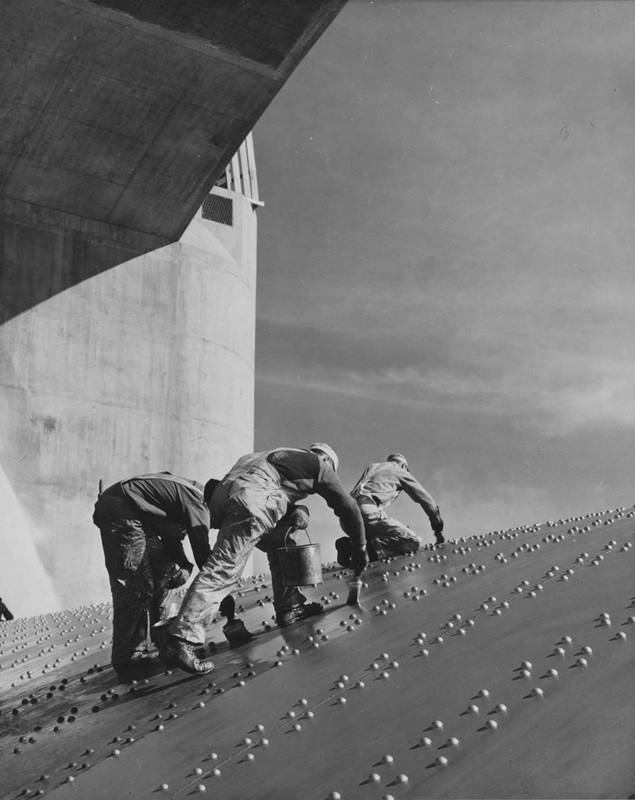 Workers apply a coat of paint to one of the dam’s spillways. 1936. The dam nears completion. 1935. 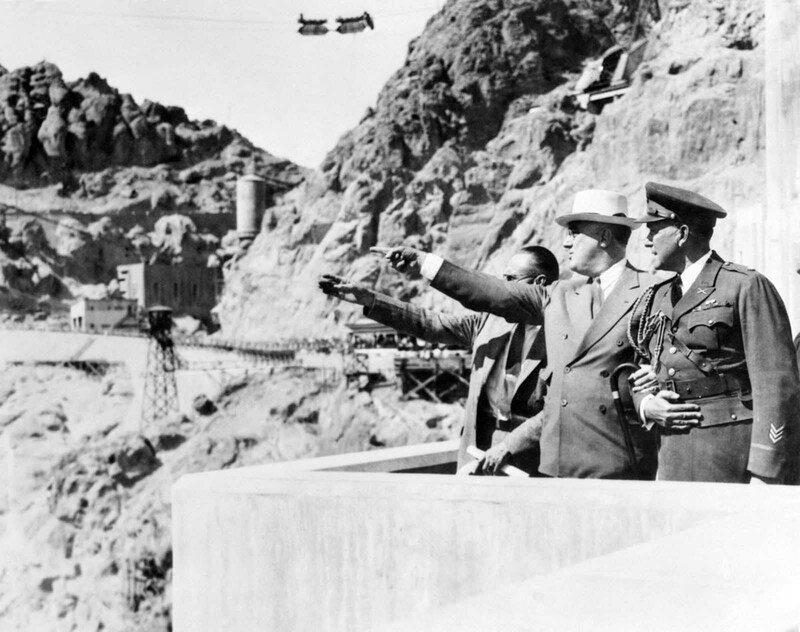 President Franklin D. Roosevelt tours the dam. 1935. Kaufmann greatly streamlined the design, and applied an elegant Art Deco style to the entire project. He designed sculptured turrets rising seamlessly from the dam face and clock faces on the intake towers set for the time in Nevada and Arizona — both states are in different time zones, but since Arizona does not observe Daylight Saving Time, the clocks display the same time for more than half the year.